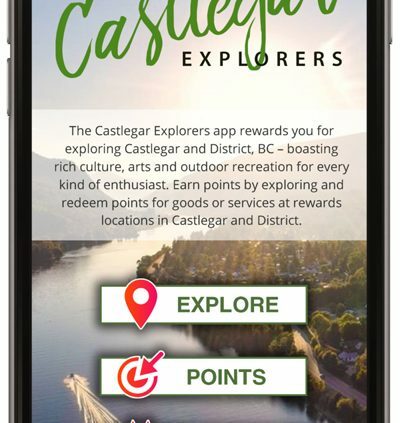 Castlegar and District Chamber of Commerce and Destination Castlegar are excited to announce the launch of their free Castlegar Explorers mobile app, which rewards users for visiting unique points of interest in and around Castlegar, BC. Once people use the app to collect points at various destinations, they can redeem those points for large discounts at more than a dozen area businesses. The Castlegar Explorers app is both a wayfinding tool and a gamified way to reward people for exploring. The app’s Explore button takes users to the map of Castlegar and district, which has pins indicating the location of the area’s unique points of interest. Clicking on each pin on the map gives more information about that place. Locations are assigned a point value. Pushing the “Collect Points” button while physically visiting a location will add the location’s points to a user’s point total. 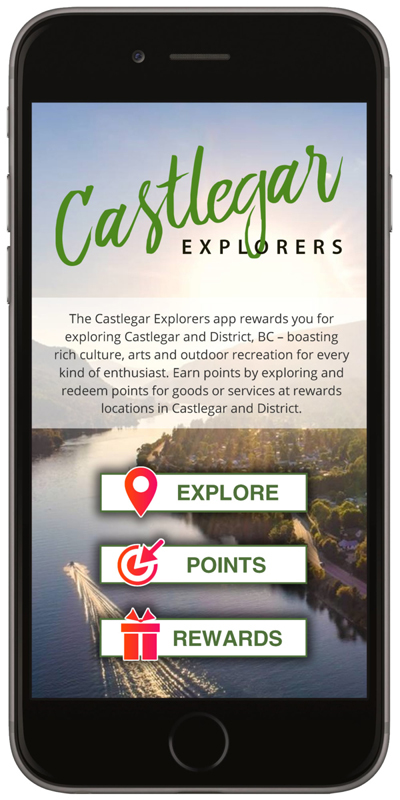 At launch, Castlegar Explorers app users can redeem their collected points for rewards ranging from discounts on tours and lodging to as much as 50% off at certain businesses. Rewards locations include: Canadas Best Value Inn & Suites Castlegar, Cartwrights Pub, Castlegar Golf Club, Crumbs Bakery, Endless Adventure Inc., Gravi Tea Coffee and Toys, Mallards Source for Sports, Mother Natures, Mountain High Lighting, Rest Assured Kootenay Floats, Sandman Hotel Castlegar, Unwind Yarns. 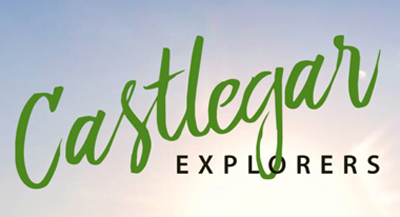 The Castlegar Explorers app is available now as a free download on the iTunes App Store and Google Play. Originally posted on Imagine Kootenay.